On lazy nights Tobie and I watch movies we didn't bother catching at the theater since we didn't feel they were worth it. These are also nights when we aren't just going to watch a movie but instead we're probably going to work on our respective computers or even play games while passively watching the movie in the background. I'm just trying to frame this review in the context of our level of commitment to watching this movie as we knew it wasn't going to be all that great. 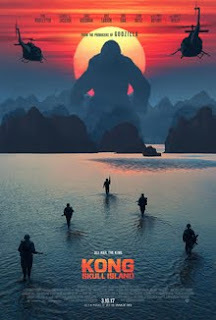 After all, the 2005 effort to reboot the franchise wasn't quite ideal so it was hard to expect more out of Kong Skull Island when it came out. Plus it's a part of the weird effort to create a shared cinematic universe among monster movies together with the also somewhat off-tone 2014 Godzilla movie. At this point I'm very concerned with this mad dash by various movie companies to develop their own cinematic universes. Sure the folks at DC need to play catch up, but now you have Legendary Entertainment trying to make this MonsterVerse as Universal is trying to come up with their Dark Universe. Synopsis: Kong: Skull Island is a 2017 monster movie reboot of the King Kong franchise. The movie was directed by Jordan Vogt-Roberts with a screenplay by Dan Gilroy, Max Borenstein, and Derek Connolly. First we are introduced to American pilot Hank Marlow (Will Brittain / John C. Reilly) and Japanese pilot Gunpei Ikari (Miyavi) as they parachute onto an island during World War II. They had been in a dogfight until they encounter a giant gorilla - the titular King Kong. Fast-forward to 1973 during the tail end of the Vietnam War American government agent Bill Randa (John Goodman) hires tracker and explorer James Conrad (Tom Hiddleston) to map out the newly discovered Skull Island. They're accompanied by a military helicopter squadron known as the Sky Devils, led by Preston Packard (Samuel L. Jackson). Their big yet unusual plan is to map the island by dropping specially designed bombs that will somehow give a better picture of the island. But before their can fully saturate the island and complete their mapping effort, they are attacked by the same giant ape creature that had been shown during the World War II flashback. It quickly takes down all the choppers of the Sky Devils and scattering the survivors across the island. Now they need to find one another and more importantly find a way off the island before the natural dangers kill them. What I Liked: The movie has a lot of fan service involved so it has interesting moment of awesome. King Kong gets to face off against several horrors of the island. And that's really want you want to see - King Kong being the ruler of his island and all that good stuff. And some of those fights were pretty good. And while the start of the giant spider scene was a little cheesy, that fight with the humans was also pretty good. Tom Hiddleston was a weird moment of calm amid all the madness and I suppose that was reassuring enough. Seeing him on screen was like a reminder of all the other interesting movies and TV shoes he had been in other than this one. Good times. What Could Have Been Better: The story makes no sense, even for a monster movie. Tying the World War II part of the story felt crazily superfluous to things and the decision to force time-place set the movie within the Vietnam War period also felt unnecessary. If they're just doing this to have the confrontation between Godzilla and King Kong to happen at a key point in the modern period, I still don't think they needed to make him so old. The final monster was sort of interesting but mostly not? At least the fight was generally good but there was something about the monster design that felt off for some odd reason. But that's probably more just me. But we were better off with just the monsters instead of all this weird human pseudo drama. And Samuel L. Jackson is now limited to just playing a stereotype angry black man. TL;DR: Kong: Skull Island is a movie you go to see because you want to see giant animals fighting one another. Naturally the military is useless so it's about the giant monsters. And so the movie gets 2 big monster battles out of a possible 5.